With bipartisan discussions in the lower chamber seemingly on the brink of collapse, six Republican senators met with weary House conservatives on Wednesday afternoon to discuss the prospects of immigration overhaul. 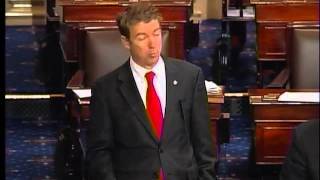 After nearly 13 hours of talking, Sen. Rand Paul’s filibuster is one for the history books. The Kentucky Republican comes in at No. 9 on a draft list of longest Senate speeches kept by the historian’s office, clocking in at 12 hours and 52 minutes. 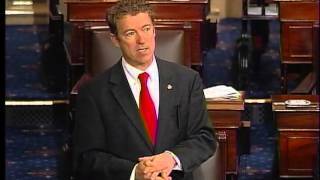 Today, Sen. Rand Paul took to the Senate floor to participate in an active filibuster of President Obama’s nominee for director of the Central Intelligence Agency, John Brennan. Sen. Paul’s remarks began at 11:47 a.m. ET, and as of this release, he is still participating in the filibuster. Below is video and an unofficial transcript of his remarks between approximately 5:47 p.m.-6:47 p.m. The following links will direct you to hours 1, 2, 3, 4, 5, and 6. 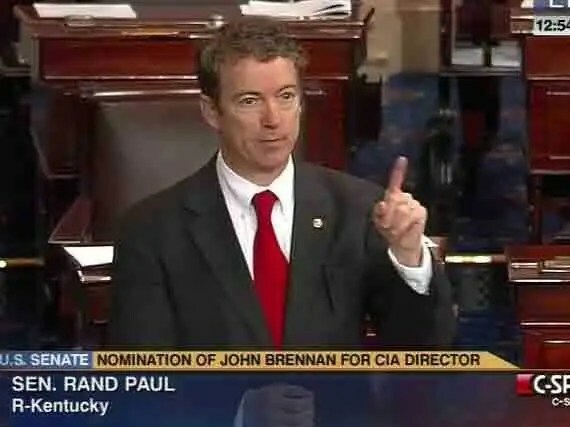 Today, Sen. Rand Paul took to the Senate floor to participate in an active filibuster of President Obama’s nominee for director of the Central Intelligence Agency, John Brennan. Sen. Paul’s remarks began at 11:47 a.m. ET, and as of this release, he is still participating in the filibuster. Below is video and an unofficial transcript of his remarks between approximately 4:47 p.m.-5:47 p.m. The following links will direct you to hours 1, 2, 3, 4, and 5. 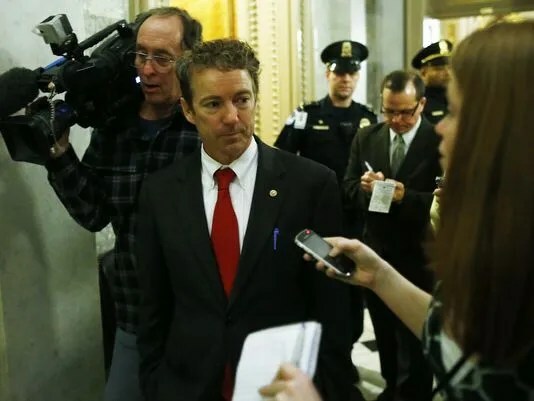 UNOFFICIAL TRANSCRIPT: Hour 5 – Sen. Rand Paul Filibuster of Brennan Nomination Today, Sen. Rand Paul took to the Senate floor to participate in an active filibuster of President Obama’s nominee for director of the Central Intelligence Agency, John Brennan. Sen. Paul’s remarks began at 11:47 a.m. ET, and as of this release, he is still participating in the filibuster. Below is video and an unofficial transcript of his remarks between approximately 3:47 p.m.-4:47 p.m. Click HERE, HERE, HERE, and HERE for video and transcript of hours 1, 2, 3, and 4. 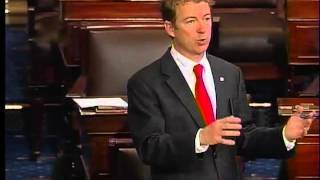 Today, Sen. Rand Paul took to the Senate floor to participate in an active filibuster of President Obama’s nominee for director of the Central Intelligence Agency, John Brennan. Sen. Paul’s remarks began at 11:47 a.m. ET, and as of this release, he is still participating in the filibuster. 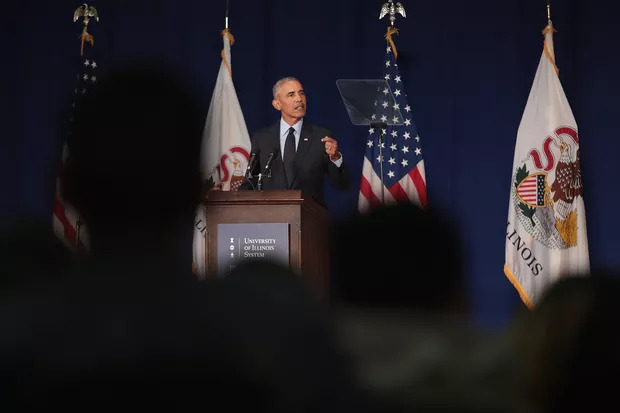 Below is video and an unofficial transcript of his remarks between approximately 2:47 p.m.-3:47 p.m. Click HERE, HERE, and HERE for video and transcript of hours 1, 2, and 3. 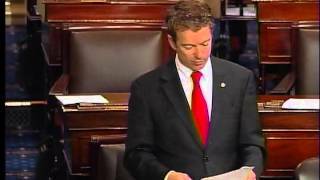 Today, Sen. Rand Paul took to the Senate floor to participate in an active filibuster of President Obama’s nominee for director of the Central Intelligence Agency, John Brennan. Sen. Paul’s remarks began at 11:47 a.m. ET, and as of this release, he is still participating in the filibuster. Below is video and an unofficial transcript of his remarks between approximately 12:47 p.m.-1:47 p.m. 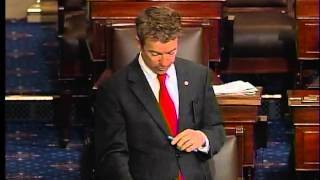 The first hour of Sen. Paul’s filibuster can be found HERE. 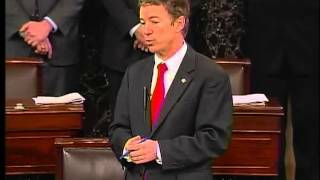 Today, Sen. Rand Paul took to the Senate floor to participate in an active filibuster of President Obama’s nominee for director of the Central Intelligence Agency, John Brennan. Sen. Paul’s remarks began at 11:47 a.m. ET, and as of this release, he is still participating in the filibuster. Below is video and an unofficial, rough transcript of his remarks between 11:47 a.m. and 12:47 p.m. I think that’s a good way of putting it, because when you think about it, obviously they’re killing some bad people. This is war. There’s been some short-term good. The question is, does the short-term good outweigh the long term cost, not only just in dollars but the long-term cost of whether or not we’re encouraging a next generation of terrorists? This is a quote from Bruce Riedel, a former CIA Analyst. He says, “The problems with the drones is it’s like your lawn mower. You got to mow the lawn all the time, the minute you stop mowing, the grass is going to grow back. Maybe there is an infinite number of terrorists. Maybe the drone strikes aren’t the ultimate answer. There is a billion Muslims in the world, maybe there needs to be some component of this that isn’t just the killing fields. I’m not saying that many of these people aren’t allied against us and would attack and they don’t deserve to die. I’m just not sure that it is the ultimate earns the ultimate way. I’m also concerned that many of the people who are the strongest proponents of this are also the ones that want to bring the war to America and say that America is part of this perpetual battlefield. The United States now operates multiple drone programs, including acknowledged U.S. Military patrols over conflicted zones in Afghanistan and Libya and classified CIA surveillance flights over Iran. Strikes against al Quaed are carried out under secret lethal programs involving the CIA and the JSOC. The matrix was developed by the NCTC to augment those organizations separate with overlapping kill lists. The result is a single continually evolving database in which biographies, locations, known associates, and affiliated organizations are all cataloged. So are strategies for taking targets down. Including extradition requests capture operations and drone patrols. Obama’s decision to shutter the CIA’S secret prisoners ended a program that had become a source of international scorn but it also complicated the pursuit of terrorists. Unless a suspect surfaced on the sight of a drone, the United States had to scramble to figure out what to do. We had a disposition proficiency said a former U.S. Counterterrorism official. The database is meant to map out contingencies, create an operational menu that spells out each agencies role in case a suspect surfaces in an unexpected spot. If he’s in Saudi Arabia picked up by the Saudis, if traveling overseas to al-Shabaab, we can pick him up by ship. If in Yemen, kill or have the Yemenis pick him up. There’s been some discussion as to what to do with these people. It is a complicated situation. But I think the take-home message from all of this is what we’re stuck in is a very messy sort of decision making, a type of decision making that I don’t think is appropriate for the homeland Is appropriate for the United States. I think the idea that in the United States that this is to be a battlefield and that you don’t need an attorney, you don’t need a court, you don’t get due process is really repugnant to the American people and should be. I think it’s something that we have given up on too easily if we let the President dictate the terms of this. If the President is unwilling to say clearly and unequivocally that he is not going to kill noncombatants in America, I don’t think we should tolerate that. I think there should be a huge outcry and the President should come forward and explain his position. This discussion tonight really isn’t so much about John Brennan. It isn’t about his nomination so much as it’s about whether or not we believe that in America there are some rights that are so special that we’re not willing to give up on these. So as we move forward into this debate, it’s not really about who gets nominated to be the head of the CIA It’s about principles that are bigger than the people. It’s about something bigger and larger than the people involved. It’s about Constitutional principles that really we shouldn’t give up on. I think we should all judge as inadequate the President’s response when he says he hasn’t killed Americans in America yet, he doesn’t intend to, but that he might. I don’t think that that is a response that we should tolerate. And so as we move forward in this debate, we need to understand and we need to fight for something that is classically American, something that we are proud of and something that our soldiers fight for, and that is our rights, our individual rights, our right to be seen as an American, to be tried in a court by our peers, and I think if we were to give up on that, it’s a huge mistake. One of the things we have to ask is what kind of standard will there be? If there is going to be a program in America, what kind of standard, you know? If we’re going to kill Americans in America, what kind of standard will there be? If the standard is to be sympathy, you can imagine the craziness of this. Mr. President, I would at this time yield for a question without yielding the floor to my colleague from Kansas. The presiding officer: The Senator from Kansas. SEN. MORAN: Mr. President, thank you. Through the chair, I – through the president, I would like to ask the senator from Kentucky a couple of questions. 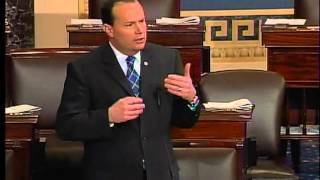 I have been listening to the – to the conversation to the debate, to the discussion here on the senate floor throughout the afternoon, and I am – I would ask the senator from Kentucky these questions – is it not true that the constitution of the United States is a document designed to protect the freedoms and liberties of Americans? Often, the Constitution, I believe, I would ask again the Senator from Kentucky, is the document while sometimes perceived to be a grant of authority is not really the main purpose of the United States Constitution to make sure that the American people enjoy certain liberties and freedoms that the founding fathers who wrote that document believe were important for American citizens, and whether or not that’s true, I will let the gentleman from Kentucky tell me, but if that is the case, if it is Constitutional to intentionally kill an American citizen in the United States without due process of law, then what is not Constitutional under the United States Constitution? If the conclusion is reached as the administration – at least is unwilling to say is not the case, if the conclusion is reached that it is within the powers of the Constitution for the Executive to allow for the killing of an American citizen in the United States, then what is left in our Constitution that would prohibit other behavior? If you can go this far, what liberties remain for Americans? 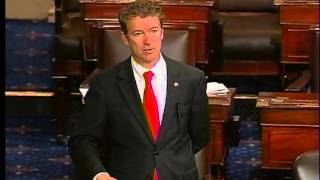 SEN. PAUL: Ultimately, the question is who gets to decide? Does the President get to decide unilaterally that he is going to do this, and how would you challenge it? You know, if you’re dead, you have a tough time challenging basically his authority to do this. But no, I can’t imagine any way that you can usurp and go beyond the Constitutional requirements in the United States. I see no way he can do that, and I can’t imagine that he would even assert such a thing. But it still boggles the mind that he won’t explicitly say that he will not do this. SEN. MORAN: Request the President to ask a question of the Senator from Kentucky. Again in the absence of the assurance or the statement from the administration, from the President of the United States or his attorney general, the appropriate venue of the Senator from Kentucky is not the appropriate venue for us to insist upon that – that answer. Is it not appropriate for this to be the venue on which, the United States Senate, made clear that it is unconstitutional in our view for the death of united states a United States citizen in the United States by military action, this is the opportune moment because of the pending confirmation of the nomination of the head of the Central Intelligence Agency. And so while today’s order of business really is an administrative appointment, is this issue not so important that we need to utilize this moment, this time in the United States Senate to make certain that that question is answered in a way that makes clear not only for today and for the current occupant of the CIA And its administration, but for all future Americans, all future CIA’S, all future military leaders that it is clear that in the united states American citizens cannot be killed without due process of law. 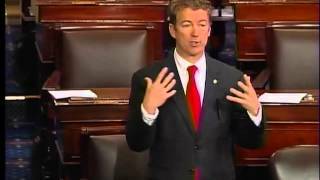 SEN. PAUL: Mr. President, I think it’s a good point. I think it’s also a point to be made that that would be also one resolution to this impasse would be to have a resolution come forward from the Senate saying exactly that, that our understanding is – and this has been something that Senator Cruz and I have discussed – is that whether or not we should limit the President’s power by legislation or by resolution, basically saying that repelling an imminent threat is something the President can do but killing noncombatants is not something that’s allowed under the Constitution. I think the courts would rule that way should the courts ever have to rule on this, but it would be much simpler and more healthy for the country if the president would simply come out publicly and say that. SEN. MORAN: Finally, I would ask the Senator from Kentucky, while this opportunity to discuss this issue on the Senate floor has occurred today, it certainly is an opportunity for the American people to understand a significant basic Constitutional right may be at stake, and while the Senator from Kentucky has led this discussion, I would ask him has he now received as a result of bringing this attention to this issue any additional reassurances from the Attorney General or the President of the United States that the administration agrees that there is no Constitutional right to end the life of an American citizen using a drone flying over the lands of the United States and attacking a united states citizen? SEN. PAUL: Mr. President, since we began this today, I have had no communication from the White House or the Attorney General. The only thing we have gotten indirectly was that the Attorney General was before the Judiciary Committee today and that he did seem to backtrack or acknowledge a little bit under withering cross-examination – he was not very forthcoming in saying that what we would like to hear is that they will not kill noncombatants in America, but I think that’s still a possibility from them, and I think his answers weren’t inconsistent with that, but you would think it would be a little bit easier and they would make it easier on everyone, and you would think they would want to reassure the public that they have no intention – not just they have no intention but that they won’t kill Americans. SEN. MORAN: Again, Mr. President, to the Senator from Kentucky, while there is a significant important issue before the United States Senate today and that is the confirmation of the Director of the Central Intelligence Agency, I would ask the senator from Kentucky is this – is not the more important issue, the less pedestrian issue that we face here on the Senate floor and in the United States of America one that has been with us throughout our history? One that was with us when the Constitution was written and one that is with us every day thereafter, and that is what are the meanings of the words contained in the United States Constitution and what do they mean for everyday citizens that they know that their own government is constrained by a document created now more than 200 years ago? Is that not the most important question that faces our country, its citizens on a daily, ongoing basis? — they truly believe and they honestly appraise that they are fighting for our Bill of Rights. So that’s why I see this as somewhat of an insult to our soldiers to say that – and to insinuate somehow that the Bill of Rights just isn’t so important, that our fear is going to guide us away or take us away from something so fundamental and so important. But I think Americans do realize that the protections of having a jury trial are incredibly important and that assessing guilt is not always easy when you’re accused of a crime. I think that Americans do know that it’s really important to try to get it right when someone is accused of a crime, and so I think the American people are with us in wanting to find these answers, and you’re right that this isn’t ultimately about the nomination. This is about a question that’s bigger I think than any individual, and it’s about something that our country was founded upon, and that’s basically the individual rights. SEN. MORAN: Mr. President, I thank the Senator from Kentucky for responding to my questions. SEN. PAUL: Mr. President, we have had a good and healthy debate today. I think we have hit upon a few points. We may have even hit a couple of points more than once. I think that it’s a – when we think about and put in perspective so many of the battles that we have up here are battles that I think the American public sometimes is disgusted with. They see a lot of things that we do as petty and partisan, and sometimes I see disagreements up here who I think are completely partisan and completely petty on both sides, but I think this issue is different in the sense that this isn’t about this particular individual and their nomination. I have actually voted for the President’s first three nominations to his cabinet, so I haven’t taken a partisan position that the President can’t nominate his – his political appointees. I have looked carefully at the nominees. I have asked for more information. I have true I had to extend debate on some of the nominees. But in the end I voted for three out of three and many of the judges that the President has put forward. Not because I necessarily agree with their politics. I don’t agree with much of the President’s politics. In fact one of the few things I did agree with the President on was the idea of civil liberties, was the idea that you don’t tap someone’s phone without a – warrant a warrant, that you don’t torture Americans and really that you don’t kill Americans without due process. These are things that really I thought the president and I agreed on. So I’m not so sure exactly, you know, where we stand with that. And I actually kind of think that probably he still does agree with me, or I still agree with him. But the question is, why can’t he publicly go ahead and announce that he’s not going to combatants? SEN. PAUL: There’s another article that I think is of interest and this is another article by Spencer Ackerman in “Wired.” This talks about once again the signature strikes and the idea that basically we’re killing people whose names we don’t know. The title of this was “CIA Drones kill large groups without knowing who they are.” The expansion of the CIA’s undeclared drone war into the tribal areas of Pakistan required a big expansion of who can be marked for death. Once the standard for targeted killings was top-level leaders in al Qaeda or one of its allies, that’s long gone, especially as the number of people targeted have grown. This is the new standard, according to a blockbuster piece in the “Wall Street Journal.” Men believed to be militants associated with terrorist groups but whose identities aren’t always known may be targeted. The CIA Is now killing people without knowing who they are on suspicion of association with terrorist groups. The article does not define the standards but the standards are said to be suspicion and association. — and that’s one of the reasons why we’re concerned here, because if the President claims that he can do strikes in America and the bulk of the current strikes overseas are signature strikes, wouldn’t it be worrisome that we could kill people in America without even knowing their name? The bulk of the CIA Strikes now are signature strikes, it was written in the “Wall Street Journal” in an article by Adam Entoise and Siobhan Gorman and Julian Barnes. And the bulk really means the bulk. The “journal” reports that the growth in clusters of people targeted by the CIA Has required the agency to tell its Pakistani counterparts about mass attacks. So we’re talking about pretty significant attacks here. They’re only notifying them when they’re going to kill more than 20 at a time. Determining who is a target is not a question of intelligence collection. The cameras on the CIA Fleet of predators and reapers work just fine. It’s a question of intelligence analysis, interpreting the imagery collected from the drones from the spies and spotters below to understand who’s a terrorist and who, say, drops off the terrorist’s laundry. Admittedly, in a war with a shadowy enemy, it can be difficult to distinguish between the two. So the question is: Is this the kind of standard we will use in the United States? Will we use a standard where people don’t have to be named? We don’t know. The president has indicated that his drone strikes in America will have different rules than his drone strikes outside of America but we’ve heard no rules on what those drone strikes will be. So we have drone strikes inside and outside. They’re going to have different rules. But we already know that a large percentage of the drone strikes overseas were not naming the person. Is that going to be the standard? We also know that we have targeted people for sympathizing with the enemy. We talked about that before. In this 1960’s, we had many people who sympathized with North Vietnam. Many people will remember Jane Fonda swiveling herself around in a North Vietnamese artilleries and thinking gleefully that she was just right at home with the North Vietnamese. Now, while I’m not a great fan of Jane Fonda, I’m really not so interested in putting her on a drone kill list either. We’ve had many people who have dissented in our country. We’ve had people in our country who have been against the afghan war, against the Iraq war. I was opposed to the Iraq war. There have been people who are against the government on occasion. What are the criteria for who will be killed? Does the Fifth Amendment apply? Will the list be secret or not secret? Can you kill noncombatants? And people say, well, the president would never kill noncombatants. The problem is, is that’s who we’re killing overseas. Now, we are alleging that they may be conspiring someday to be combatants or they might have been yesterday, but are we going to take that same kind of standard and use it in America? Are we going to have a standard that if you’re, you know, on your ipad typing e-mails in a cafe, that you can be targeted for a drone strike? These are – these are not questions that are inconsequential. These are questions that should be known and these are questions that should be public. These are questions that should be discussed in congress. These are questions – in fact, we shouldn’t be asking him for drone memos. We should be giving him drone memos. We shouldn’t be asking him how he’s going to run the drone program. We should be telling him how he’s to run the drone program. That is our authority. We’ve abdicated our authority. We have – we don’t do what we’re supposed to. We are supposed to be the checks and balances, but we’ve let the President make these decisions because we have largely abdicated our responsibility. In this Spencer Ackerman story from “Wired,” he talks about and goes on to say, “fundamentally, though, it’s a question of policy. Whether it’s acceptable for the CIA To kill someone without truly knowing if he’s the bomb smith or the laundry guy. The journal reports that the CIA’S willingness to strike without such knowledge, sanctioned in full by President Barack Obama, is causing problems for the State Department and the military. As we’ve written this week, the high volume of drone attacks in Pakistani tribal areas contributes to Pakistani intransigence on another issue of huge importance to the U.S. Convincing Pakistan to deliver the insurgent groups it sponsors to peace talks aimed at ending the Afghan war. The drones don’t cause that intransigence. Pakistani leaders, after all, cooperate with the drones and exploit popular anti-American sentiment to shake down Washington. The strike – the strikes become cards for Pakistan to play, however cynically.” And I think that’s quite true of Pakistan, they play both sides to the middle and they play both sides to get more money from us. I think they have been complicit in the drone attacks and then they complain about them publicly. They have two faces: One – one to their people and one privately to us. But the question is: Have we gotten more involved in Pakistan other than al Qaeda leaders and have we gotten more involved in Pakistan that involves more of people who want to be free of their central government? Ultimately we as a country need to figure out how to end war. We’ve had the war in Afghanistan for 12 years now. The war basically has authorized a worldwide war. Not only am I worried about the perpetual nature of the war, am I worried – I’m also worried about the geographic, that there’s no geographic limitations to the war. But I’m particularly concerned and what today has all been about is that I’m worried that they say that the United States is the battlefield now. My side, their side, the President. Everybody thinks that America’s the battlefield. The problem is, they also think you don’t get due process on a battlefield. And largely they’re correct. When you’re overseas on a battlefield, it’s hard to have due process. We’re not going to ask for Miranda rights before we shoot people in battle. But America is different. So one of the most important things I hope that will come from today is that people will say and people will listen, how do we end the war in Iraq? How do we end the war in Afghanistan? I tried to get a vote – I did get a vote, I tried to end the Iraq war two years after it ended by taking away the authorization of use of force and I still couldn’t get that voted on. It’s even more important not to end the war in Iraq but ultimately to end the war in Afghanistan. Because the war in Afghanistan, the use of authorization of force, is used to create a worldwide war without limitations. To create a war that some say the battlefield is here at home. This battlefield being here at home means you don’t get due process at home. There have been members of the Senate stand up and say, when they ask you for a lawyer, you tell them to shut up. Is that the kind of due process we want in our country? Is that what we’re moving towards? So the questions we’re asking here are important questions. And these questions are: Does the bill of rights apply? Can they have exceptions to the bill of rights? 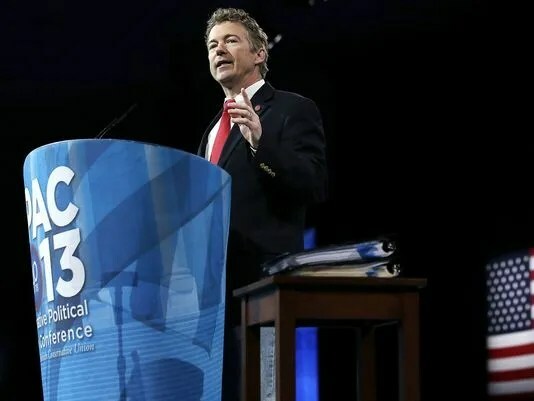 SEN. PAUL: One of the articles from “National Review” recently was by Kevin Williamson. We got into this a little bit earlier. And I thought it was an important article because it talked about, you know, what our concern is, is about what standard we will use, what will be the standard for how we kill Americans, in America. And he talks a little bit about how his belief is that Awlaki was targeted mainly as a propagandaists. And the interesting thing about Awlaki is before he was targeted, we actually invited him to the Pentagon. We considered him to be a moderate Islamist for a while. We invited him to the Pentagon. I think he actually gave and did prayers in the Capitol at one point. So the question is: If we made a mistake the first time about whether he was our friend and I think we did could you make a mistake on the other end? The question is, is if the government’s to decide who are sympathizers and people who are politicians with no checks and balances are to decide who is a sympathizer, is there a danger really that people who have political dissent could be included in this? The way Williamson describes Awlaki was “he was first and foremost an al Qaeda propagandist. He was a preach and a blogger who first began to provoke U.S. Authorities through the online bile that earned him the title the bin Laden of the internet. Was he an active participant in planning acts of terrorism against the U.S.? The F.B.I. Did not think so, at least in the wake of 9/11 attacks. The Bureau interviewed him four times and concluded that he was not involved. The Defense Department famously invited him to dine at the pentagon as part of the Islamicic outreach efforts, and in 2002, he was conducting prayers in the U.S. Capitol. Throughout the following years, Awlaki became a sort of al Qaeda gadfly, dangerous principally because he was fluent in English and therefore a more effective propagandist. It was not until the first Obamas that Awlaki was promoted by U.S. Authorities from propagandist to operations man. You may remember the context. The Obama administration had been planning to try 9/11 conspirators in New York City when the country was thrown into a panic by the machinations of the would-be under pants bomber. Williamson asked this question, though. He says “if sympathizing with our enemies and propagandizing on their behalf is equivalent to making war on the country, then the Johnson and Nixon administrations should have bombed every elite college in America in the early 1960’s. And as satisfied– these were his words, not mine– as satisfying as putting Jane Fonda on a kill list might have been, I don’t think our understanding of the law would have approved such a thing even though she did give communist aid to the aggressor in Vietnam. Students in Ann Arbor, Michigan, were actively and openly raising funds for the Vietcong throughout the war.” Would it have been proper to put them on kill lists? I don’t know. Williams says “I don’t think so. There is a difference between sympathizing with our enemies and taking up arms against the country.” They aren’t the same thing. So we have to ask ourselves what is the standard? Could political dissent be part of the standard for drone strikes? And you say well, that’s ridiculous. We have listed people already on web sites and said that they were a risk for terrorism for their political beliefs. The fusion center in Missouri listed people who were pro-life origin, listed people who believed in strong borders of immigration. They listed people who were supporters of third-party candidates, the Constitution party or the Libertarian party. These people were listed and a mailing sent out to all the police in the state to beware of these people, beware of people who have bumper stickers on their cars supporting these people. That to me sounds dangerously close to having a standard where the standard is sympathy, not for your enemies but sympathy for unpopular ideas or ideas that aren’t popular with the government. That concerns me, and it concerns me whether or not we could have in our country a standard that’s less than the Constitution. The Constitution is the standard I just can’t imagine that we would want to give up on this standard or that any president could assert that the standard would not be the Constitution. There was an article in “Human Rights First.” This is an article that was published in December 2012. It begins with this this prefacing statement. 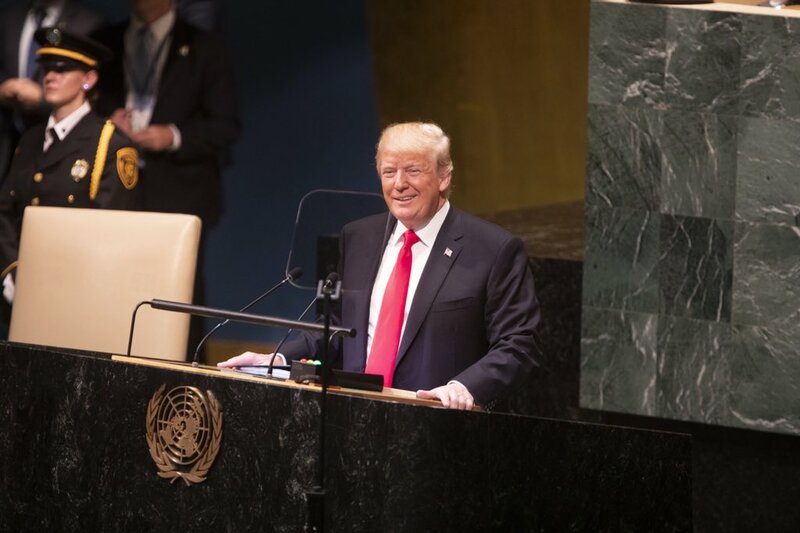 “The United States is establishing precedence that other nations may follow, and not all of them will be nations that share our interests or the premiums we put on protecting human life. Including innocent citizens.” This was a statement by John Brennan. I think it’s a statement that actually carries some weight and should be thought through. The reason why I say that this filibuster is not so much about Brennan as it’s about a Constitutional principle. The Obama administration has dramatically escalated targeted killing by drones as a central feature of counterterrorism response. So what we’re talking about is a resolution that says, what we have been trying to get the President to say is you can’t kill noncombatants. You can’t kill people in a cafe in Seattle. That’s what were asking. It is blatantly unconstitutional to kill noncombatants. I can’t understand why we couldn’t get a resolution, particularly because I am willing to with this resolution move forward and let the vote occur on Brennan. The second part of the resolution is the American people deserve a clear, concise and unequivocal public statement from the President of the United States that contains detailed legal reasoning, including but not limited to the balance between national security and due process, limits of Executive power and distinction between treatments of citizens and noncitizens within and outside the borders of the United States, the use of lethal force against American citizens, and the use of drones in the application of lethal force within the United States territory. So basically, the second part of the resolution asks basically that we do our job. That we do our job and ask the President to let us know what is going on with the program. So if there is an objection to this, it would be an objection to, one, killing citizens who are noncombatants, and two, to giving us a report on what the program will actually entail. So, Mr. President, I ask unanimous consent that at the time to be determined by the two leaders tomorrow, the Senate vote on this resolution as I just read it and with the addition to it that they then turn to the Brennan nomination or are allowed to proceed to a vote. SEN. DURBIN: Mr. President, reserving the right to object. The Presiding Officer: The Senator from Illinois. SEN. DURBIN: I would say to my friend from Kentucky, I am chair of the Constitution, Civil Rights and Human Rights Subcommittee of the Senate Judicial Committee. We are scheduling a hearing on the issue of drones because I believe the issue raises important questions, legal and Constitutional questions, and I invite my colleague to join us in that hearing if he would like to testify. I think this is something we should look at and look closely. That’s why this hearing is being scheduled. I believe at this moment it is premature to schedule a vote on this issue until we thoroughly look at the Constitutional aspects of all of the questions that you raise today which are important, and because of that, I have no alternative but to object. The Presiding Officer: Objection is heard. 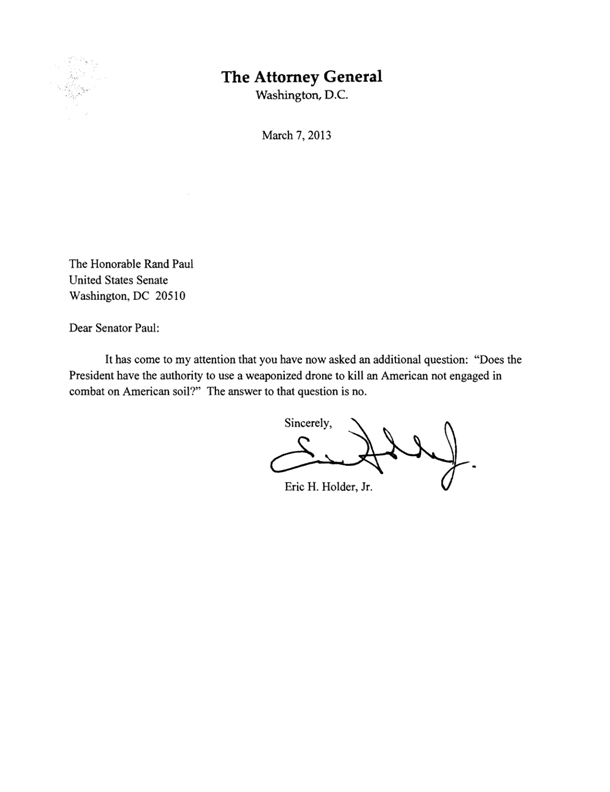 SEN. PAUL: Mr. President, I’m disappointed that the Democrats choose not to vote on this. You know, while the answer around here for a lot of things is we’ll have a hearing at some later date to be determined, the problem is that this is a nonbinding resolution. This is a resolution just stating we believe in the Constitution and hey, Mr. President, send us some information on, you know, what your plans are for how this is going to work. It doesn’t change the law. In fact, I wish we could do more than that. We have an actual law that will be introduced where we will actually try to change the law. This is a symbolic gesture. And a way to allow us to move forward, and I’m disappointed that we can’t. This was an article that was publish in “Human Rights First” back in December of 2012. Like I said, it has an opening statement by John Brennan that I think is actually well thought out and recognizes some of the advantages and disadvantages of drone strikes. He starts out by saying – this is from Brennan, “the United States is establishing precedents that other nations may follow and not all of them will be nations that share our interests.” Think about what he is saying there. Other people are going to get drones. We have already lost a drone in Iran. How long do you think it is before Iran has drones? How long do you think it is before Hezbollah has drones or Hamas has drones? So I think there is a certain amount of thought that ought to go into a drone-killing program, particularly when the people that are being killed by the drones will have their own drones, I think within short order. The Obama administration has dramatically escalated targeted killing by drones as a central feature of its counterterrorism response. Over the past two years, the administration has begun to speak more openly about the targeted killing program, including in public remarks by several senior officials. While we welcome and appreciate these disclosures, they nevertheless provided only limited information. Experts in other governments have continued to raise serious concerns about this. The precedent that the U.S. targeted killing policy is setting for the rest of the world, including countries that have acquired or are in the process of acquiring drones. Yet have long failed to adhere to the rule of law and protect human rights. So we like to believe that we actually have rules in place and we wouldn’t misuse drones. Imagine what it’s going to be like, though, when countries get drones who have none of the rules, none of the checks and balances. The impact of the drone program on other U.S. Counterterrorism efforts, including whether U.S. allies and other security partners have reduced intelligence sharing and other forms of counterterrorism cooperation because of the operational and legal concerns expressed by these countries. The impact of drone operations on other aspects of U.S. counterterrorism strategy, especially diplomatic and foreign assistance efforts designed to counter extremism promotes stability and provide economic aid. The number of civilian casualties, including a lack of clarity on who the United States considers a civilian in these situations. Of note and of consideration also is whether the legal framework for the program that has been publicly asserted so far by the administration comports with international legal requirements. The totality of these concerns heightened by the lack of public information surrounding the program require the administration to better explain the program and its legal basis and to carefully review the policy in light of the global precedent it is setting and serious questions about the effectiveness of the program on the full range of U.S. Counterterrorism efforts. While it is expected that elements of the U.S. government’s strategy for targeted killing will be classified, it is in the national interest that the government be more transparent about policy considerations governing its use as well as its legal justification. And that the program be subject to regular oversight. Furthermore, it is in the U.S. national security interest to ensure that the rules of engagement are clear and that the program minimizes any unintended negative consequences. How the U.S. operates and publicly explains its targeted killing programs will have a far-reaching will have far-reaching consequences. The manufacture and sale of unmanned aerial vehicles is an increasing global industry and drone technology is not prohibitively complicated. I’ll give you an idea that there’s a marketplace f drones. Last year I introduced a bill to require a warrant before you can use a domestic drone to spy on citizens. And before I introduced it or anybody knew outside my office, we already had calls and lobbying coming from drone manufacturers. So this is a big business. Some 70 countries already possess drones, including Russia, Syria, and Libya, and others are in the process of acquiring them. — and I think this is an important point, because everybody’s always talking about, don’t worry, you’re fine, you’re not a terrorist, we’re only going out after terrorists. The problem is, is that, like I said, the government has defined terrorism in this country to mean things that may not include terrorists. Paying cash, you know, having weatherized ammunition, you know, there’s a lot of different things that they’ve used as definition. But so we say that we’re going after al Qaeda, people who work with them or associated forces. What exactly that means, I don’t know, particularly because even al Qaeda is a little bit hard to define because they don’t have membership cards, some of them probably don’t use the label at all. I doubt many of them have any communication with any kind of central headquarters or central group called al Qaeda. But by declaring that it is an armed conflict with al Qaeda’s associated forces without articulating limits to that armed conflict, the United States is inviting other countries to similarly declare armed conflicts against groups they consider to be security threats for purposes of assuming lethal targeting authority. Moreover, by announcing that all members of such groups are legally targetable, the United States is establishing exceedingly broad precedent for those who can be targeted. Even if it is not to utilize the full scope of this claimed authority, as an alternative to armed conflict based targeting, U.S. Officials have claimed that targeted killings are justified as self-defense. Responding to an imminent threat. The problem is, is that; you know, we defined imminent to be not immediate, so having a murky definition of what imminent is allowed us to really run into problems. It’s also not clear that the current broad targeted killing policy serves U.S. Long-term strategic interests in combating international terrorism. Although it has been reported that some high-level operational leaders of al Qaeda have been killed in drone attacks, studies show that the vast majority are not high-level terrorist leaders. National security analyst and former U.S. Military officials increasingly argue that such tactical gains are outweighed by the substantial cost of the targeted killing program, including growing anti-American sentiment and recruiting support for al Qaeda. The broad targeted killing program has already strained U.S. Relations with allies and, therefore, has impeded the flow of critical intelligence about terrorist operations. The problem is, when we talk about this, particularly, you know, one of the most important things to our intelligence is actually human intelligence. We get information from people who are our friends, who live in those countries, blend into the population, are part of their population. But, you know, we’ve gone on and some of this we have destroyed in the sense that one of the people who helped us to get bin Laden was a doctor in Pakistan by the name of Dr. Shakil Afridi. If you don’t stand by the people who give you intelligence and give you information, you won’t get more. But when he did help us, somehow his name was leaked. I don’t know where the leak came from but his name was leaked and then he was arrested by the Pakistanis and he’s now in prison for the rest of his life. So I’ve asked several times, both to the previous secretary of state as well as to the current Secretary of State, and I asked the current Secretary of State point blank and directly, will you use the leverage of foreign aid to say we’re not going to give you foreign aid if you don’t release this doctor who gave us information? And it’s a little bit ironic that we won’t do it, particularly since at one point in time we actually had a $25 million reward I think for any information that led to help to getting bin Laden. So it’s kind of disappointing that we haven’t really held out and supported our human intelligence and people like Dr. Afridi, who helped us get probably the most notorious terrorist of the last century. The U.S. Government doesn’t report the number of deaths from drone strikes. Independent groups have estimated, though, that they have claimed several thousand lives so far. Estimates and public comments by some Senators have said as much as 4,700. Now, what we don’t know about the 4,700 but what would be an important statistic, I think, or maybe a troubling statistic, would be how many of the 4,700 were killed in combat, actually holding weapons, fighting, going from a battle? And how many of the drone strikes were actually on people that weren’t involve in combat? And I think if we were if that number were released, I think if that number were made public, it would concern you even more because you may well find out that a lot of the people and we’ve seen some of the strikes on television. People in their cars, people walking around without weapons, people eating dinner, people at home in their house. Now, I’m not saying these are good people necessarily. I’m just saying that the drone strike program that we have in place currently seems to have a fairly low threshold for who they kill. And the question would be whether or not you’re going to use that standard if you have a domestic drone strike program in the United States. And so I think really we’re getting to the point and that is one of the most important questions as we look at the foreign drone program is understanding what are the parameters that allow us to kill people in foreign countries and are those parameters going to be used here? Well, for the most part, over the last decade, they haven’t admitted we have a drone strike program but now they admit it. The President doesn’t want to answer any questions about it, doesn’t say he won’t use it here, just that he’s not intending to use it here, and then says well, probably there would be different rules inside the U.S. Than outside the U.S. The problem is, and this is where the Senate ought to get involved instead of punting this to another time, the Senate ought to get involved and what the Senate ought to do is say, we’re not going to wait for the President to send us a memo. We’re going to send him a memo. We’re going to tell him what the rules are drone strikes are. We’re going to tell him that the Constitution does apply to Americans, particularly Americans in the United States, and that there are no exceptions. You know, I find it inexcusable that the Attorney General says, well, the Fifth Amendment, we will, you know, use it as needed, basically. We’ll use it when we choose. And the problem with that is, is that I don’t think the executive branch should get to pick and choose. Mr. President, without yielding the floor, I’m going to allow a question from my colleague from Texas. 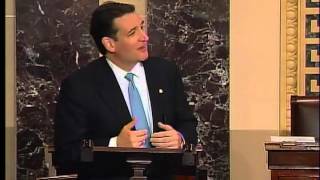 SEN. CRUZ: I thank the Senator from Kentucky and I want to ask the following question. If the Senator from Kentucky is aware of the reaction the American people have had to his extraordinary efforts today? And given that the Senate rules do not allow for the use of cellular phones on the floor of the Senate, I feel quite confident that the Senator from Kentucky is not aware of the Twitter verse that has been exploding. So what I wanted to do for the Senator from Kentucky is give some small sampling of the reaction on Twitter so that he might understand how the American people are responding to his courageous leadership. To Senator Paul’ doing something that the last four years has happened far too little in this chamber, which is standing up and fighting for liberty. So I will read a series of tweets. 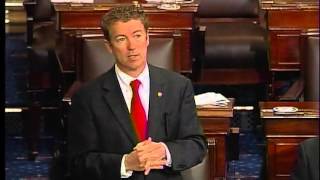 “Rand Paul filibusters Brennan nomination. Over four hours now. Glad someone in the Senate has some spine.” That was tweeted awhile ago. Now, I will note to the Senator from Kentucky and ask his reaction to these. This is but a small sampling of the reaction in Twitter, indeed in my office. I think the technical term for what the Twitter verse is doing right now is called blowing up. And I would suggest to the Senator from Kentucky and then ask his reaction, I would suggest that this is a reflection of the fact that the American people are frustrated. They are frustrated that they feel too few elected officials in Washington stand for our rights, are willing to rock the boat, are willing to stand up and say the Constitution matters and it matters whether it’s popular or not. It matters whether my party’s in power or another party is in power. The Constitution matters, our rights matter, and so many Americans I think are frustrated that they view elected officials as looking desperate to stay in power, desperate to be re-elected, desperate to do everything except fight for the Constitution and fight for our liberties, and I think this outpouring that the Senator from Kentucky is seeing is a reflection of that great frustration, and I join with the sentiments of these and many others on Twitter. And so I ask the Senator from Kentucky if he was aware of this reaction and what his thoughts are to the many thousands more who I haven’t been able to read their tweets and their words of encouragement as the Senator from Kentucky, more than anyone is standing with Rand.